A cloud has caught on her steep summit pyramid, and streams downwards; the black frozen rock of the ridges peeks through its airy whiteness. I stop in the middle of the path on the moraine leading to Everest Base Camp, and take a picture of my stone idol, Chomolungma. Somewhere up there, where the summit pierces the cloud, as if cutting through a dream, beats my heart: I always say that I left it up there – so no one could have it, not even I. I put the camera away, and carry on to EBC at the foot of the notorious Khumbu Icefall, which has already swallowed one life this climbing season. As it shows off its enormous teeth of ice to the morning sun, I pray for the Sherpa ‘Icefall Doctor’, who died in a crevasse just two days earlier. ‘Are you afraid?’ I ask myself. No. I am worse than afraid – I am indifferent to the task, which lies ahead of me and to the outcome of the expedition. This feeling – indifference – has been with me ever since I landed in Kathmandu after my stay in Bangkok. 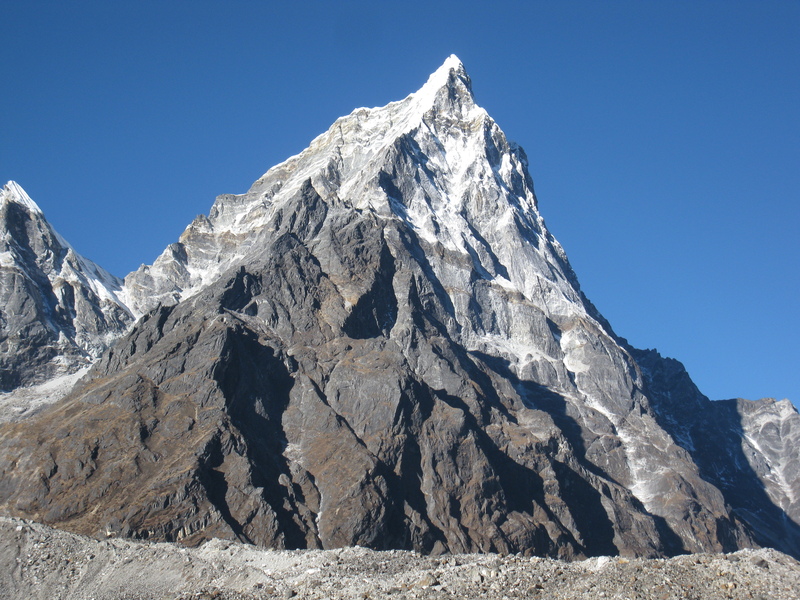 I carried it on my shoulders all the way up to 5300 meters; I slept with it; I fed it; I hoped to appease it, so, satisfied, it would leave me and give room to the passion and love I used to always feel for the Himalaya. Yet, my indifference only grows bigger and fatter as I approach the foot of Everest. After trekking for 6 days, ill, I kneel beside my backpack in my tent at the foot of the Icefall and Everest, – home to be for the next month-and-a-half – and like a ghost of somebody long-gone, indifference kneels by my side and wonders: ‘If this is truly your dream still, to climb Everest for the second time, then, why am I here? And if it isn’t your dream, then, why are you here?’ These are good questions, even put to one belatedly, and they must be answered before it is too late. The answer to the first question surprises and devastates me. 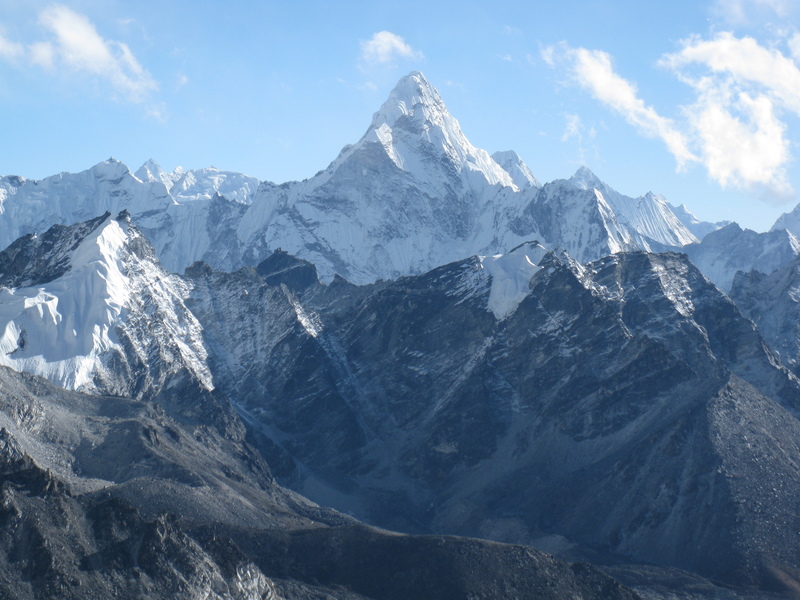 Mountains were her dreams, and Chomolungma – the grandest, most sacred of them. She is gone now, she, in whose skin I live. 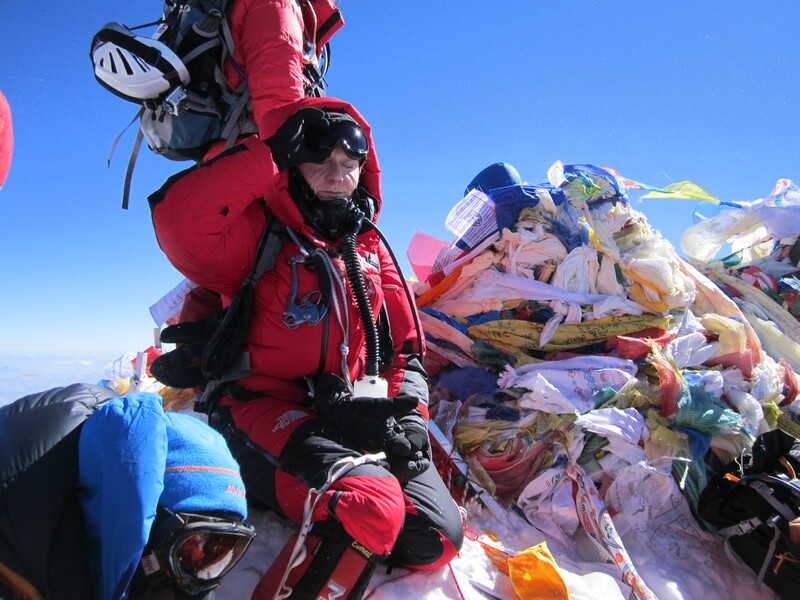 I think, what she learnt about herself and others after Pumori made her want to go: made her want to do a solo on Cholatse in winter – a suicide mission; made her want to be punched, and kicked, and humiliated to no end until she would finally stop dreaming. Her last dream came true – she disappeared, and nowhere within me can I feel her presence. It seems that her dreams vanished with her. The answer to the second question is that some things must be seen and touched to make one believe they are possible, real and irreversible. I had to see and touch Everest to believe I didn’t want to climb on The Mountain again. I would trek to Everest Base Camp through the land I used to love, looking at the skyline and the ‘friends’ of my past, the harsh and stunning Himalayan peaks, following trails, on one of which, one day in 2009, I remember feeling spotlessly, perfectly happy for a few minutes. Yet, no matter how hard I would try to feel what the ‘I’ from just a few months back doubtless would be feeling, I couldn’t see anything but blurry images from the past: they were overflowing with love, curiosity, ambition, passion, hope, pain – her everything. What they lacked now was life: they were but beautiful pictures to be hung on the wall and admired, but one could not live in a frame. 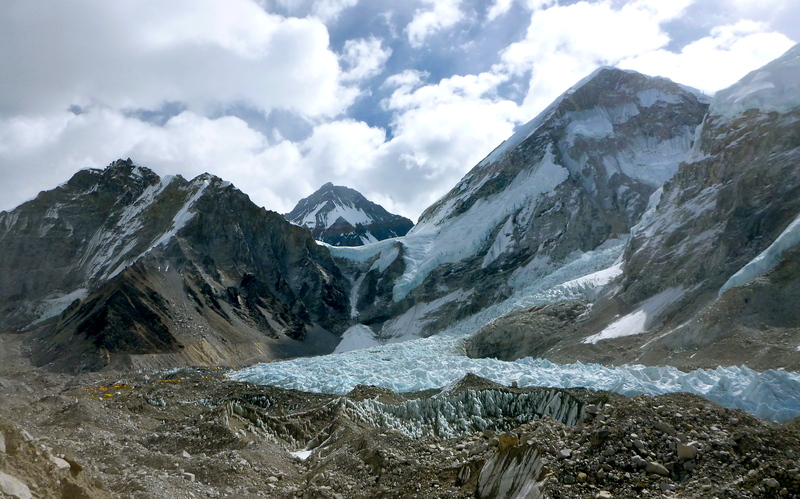 When I stood at the foot of Chomolungma this season, I realized that climbing on Her slopes would be like trying to stage a scene from last year’s summit photo and improve on it to make the perfect picture. ‘Move slightly to the right, don’t forget to cry with emotion; hide that oxygen mask…’ What would such a picture be a picture of, if not one’s own greed and vanity? Not even she, who couldn’t stop dreaming of Chomolungma, would want such a photo on her wall, let alone I. Although I do not share her dreams, I respect them as a memory of someone, who was superior to me in a million ways. I could have climbed – if anything, I am stronger and more experienced now than I was last season – but what good is any of this, if the Dream and the Dreamer have both been lost? 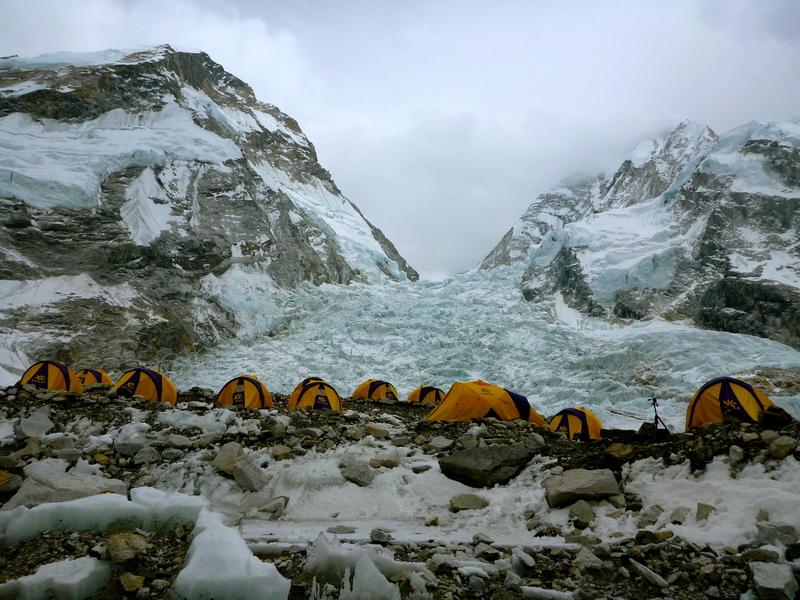 I spend two nights without sleep at Everest Base Camp, watching condensation form on the thin walls of my tent and listening to the rumble of avalanches and the creaking of ice all around base camp. In the dark and the cold I try to reason with myself: ‘You are already here. Just… do it! Think of all the people, who are supporting you in this, who call you inspirational, to whom what you do means something – even if it no longer means what it used to mean to you! Climb for them!’ But I can’t – I can’t inspire what I don’t truly and honestly feel myself. 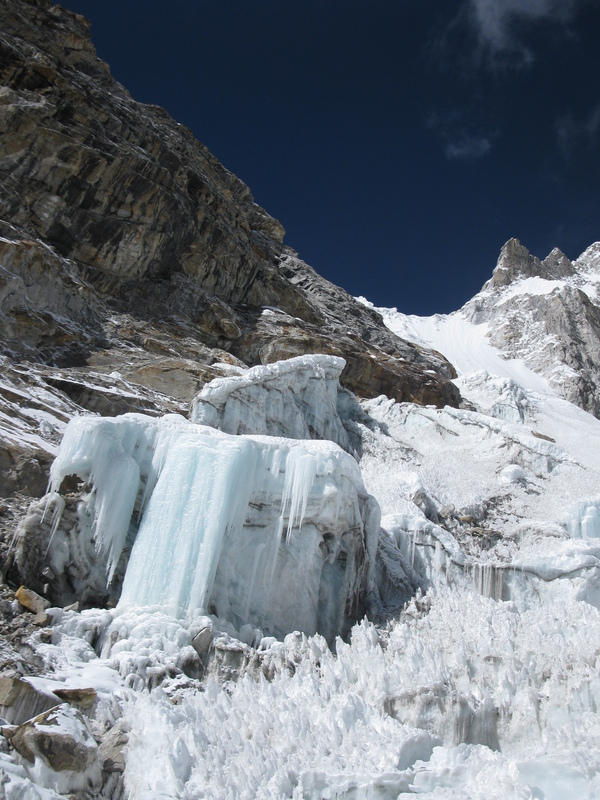 The morning I make the final decision to abort my expedition, I go towards the gaping mouth of the Khumbu Icefall. It is still very early and cold, and I am the only one outside. 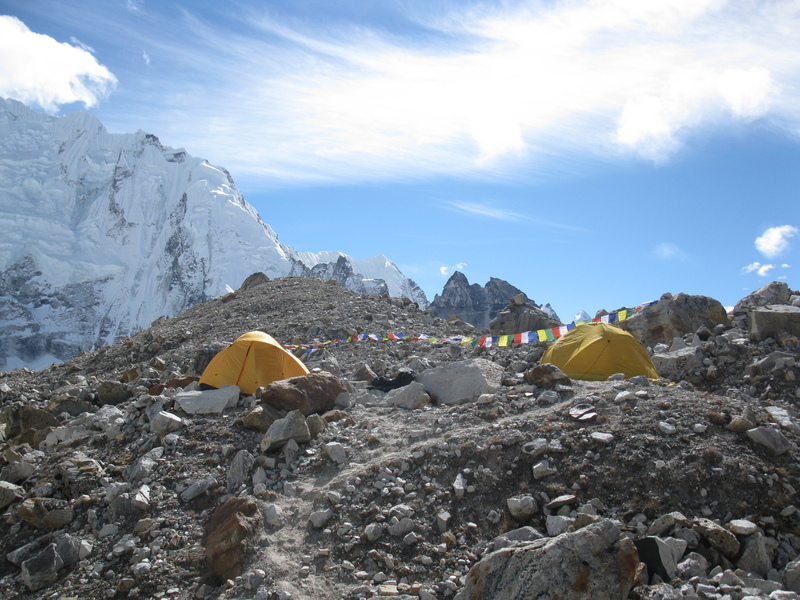 I walk as far as I can from the sleeping base camp to get as close as I dare to Chomolungma. I can’t see Her, but I feel that She is there. I talk to the stone Goddess in a whisper, and, before turning away, throw something into the Icefall’s white mouth – something she, the Dreamer, treasured. 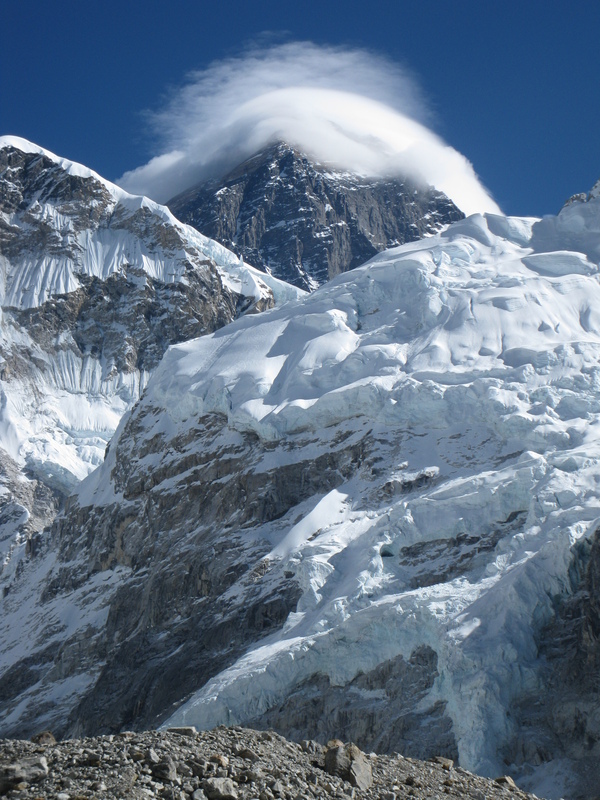 ‘Good-bye,’ I say to the Dream, and to her, who had dreamt the Dream so well and fulfilled it, and to my heart, which remains where she left it, ‘good-bye!’ Simultaneously, an enormous serac collapses onto the Khumbu Glacier from the slopes of Nuptse. ‘Good-bye,’ thunders Chomolungma in reply. Then, I know I am free to leave. 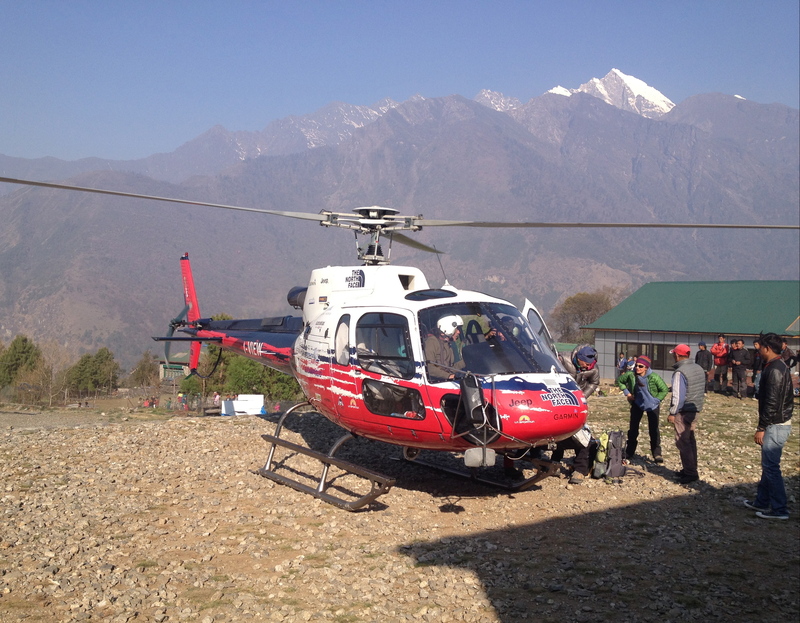 A helicopter picks me and a couple more people up at base camp and ferries us to Lukla. From there we fly to Kathmandu next morning. I will rest here for a few days before starting to pack again and leaving Nepal to travel elsewhere. As you may have guessed, I will be taking an indefinite break from mountaineering. Thank you for dreaming with me, for believing what I believed in and for supporting me! I will continue to blog, and, I think, I already know what I will be writing about. Drop by if you’d like to join me on a different kind of adventure! I titled my last year’s article about physical preparation for the Chomolungma expedition in Tibet ‘How NOT to Train for Everest’. I believe, it was a good name for the post, which stressed heavily the importance of mountaineering training and gaining climbing experience over physical conditioning. Indeed, I climbed quite a lot in 2011-12, and it certainly served its purpose: I was mentally and physically ready for the ascent of the world’s highest mountain, and not even a severe chest infection prevented me from reaching the summit. However, as climbers well know, that’s only half way, with the descent being the much harder half. No doubt, mountaineering experience and knowledge are still very important at that stage but physical strength – no less so. 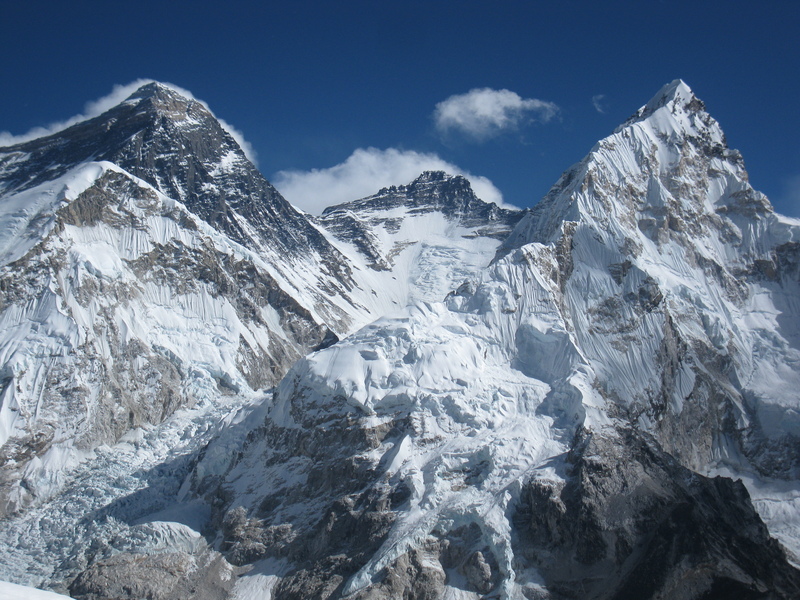 My climbing adventures after Everest have been… interesting. From the disastrous avalanche and hungry crevasses on Manaslu to the beautiful unclimbed Yangra and the heartbreakingly cold Pumori, the post-Chomolungma expeditions have, as they always do, taught me many tough lessons and given me much food for thought. The Himalaya hurt and soothed me, invited me in and pushed me away. 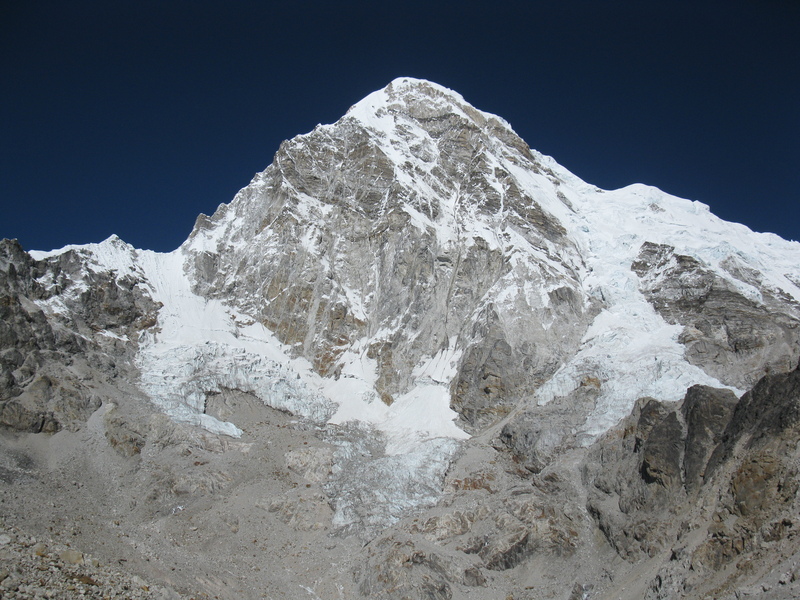 Pumori in particular proved a short but intense climb that left me feeling like I should give my crampons a break. Yet, I still had to train, and train hard, for the unprecedentedly challenging spring climbing season. 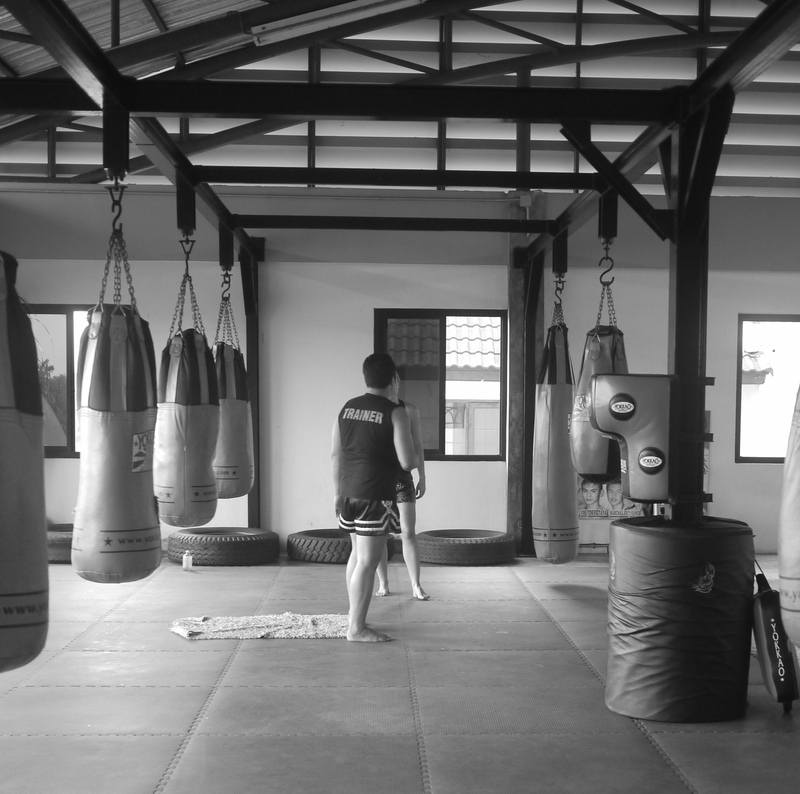 I decided on training Muay Thai in Thailand for many different reasons, with the most important one of them being that I simply needed to change. I had changed many times before, as my long-time readers know, dressing up as various ‘characters’: from ballerina to bullfighter, from tech diver to high-altitude mountaineer (here’s a recent short interview, which focuses on my climbing: http://holikenoli.com/liudmila-mikhanovskaya-mountaineering-himalaya/ ). What I have never been is someone who is able and willing to hurt another sentient being. ‘But bullfighting…’ you could reproach me. All I did was attend a bullfighting school for two years to write a paper on the ethics of the sport/art, and I never fought in the ring. I was about 20, and I was curious. Now I feel like I know something about different kinds of pain, and I would not wish to inflict any kind of it on any kind of creature. Perhaps, that is where I fail myself – in that I am ultimately defenseless, both mentally and physically. After Pumori I had to learn to be different. I had my doubts and reservations before I left Kathmandu for Bangkok, so I watched movies and videos about Muay Thai to get myself all excited about the upcoming training. Ready and eager to learn, I showed up to my first private class in the north of Thailand. To no surprise of mine, I was completely terrible: I couldn’t stand up right, punch or kick, or knee, or elbow, or ‘teep’ or… anything. What was surprising was that some western students from the gym had the brilliant idea of videoing my first session on pads (which wasn’t pretty, for sure) and playing it back adding commentary, sighs and outbursts of laughter where appropriate. My trainer, too, looked at me in amazement at how much of a ‘beginner’ I really was. His countenance was understandable as most Muay Thai students come to Thailand to work on the skills they began developing at home; few people just walk into a training camp and say: ‘I know nothing, teach me everything’. That, anyway, was my introduction to Muay Thai: learning to ‘walk’ at 26 to the sounds of laughter from my much more advanced peers and incredulous stares and smirks from Thai trainers and fighters. To be honest, I wasn’t sure I was up for it all – again. I had been the funny beginner too many a time before and knew exactly how hard it would be to fight for what I still wasn’t sure I really wanted. I attended one more training session at another gym, which went as badly as the first one, and decided to leave the idea of learning Muay Thai for a while, dedicating some time to travel in the pretty Thailand. Yet, Muay Thai had already conquered itself a place in my mind, and I couldn’t stop thinking about it. ‘How easily you gave up,’ I kept scolding myself, ‘how quickly you threw away a beautiful idea – because somebody laughed at you and thought you were an old, clumsy white lady. And so you are, but you’re more than that. Or are you? Get back in there and find out!’ Oh, it is wonderful when stubbornness replaces reason and talent, albeit temporarily! Instead of finding a relaxed, unassuming camp by the beach, I decided to train in the heart of Muay Thai, Bangkok, at one of the city’s and, therefore, the world’s top camps. There, I thought, the training would be harder, the demands – higher, the trainers – better, and the example set by some of the best nak muays (thai boxers) out there – fantastic motivation to train hard and progress quickly. The laughter, of course, would be louder, too, because, although the camp, as almost every camp in Thailand, ‘welcomes’ beginners, the trainers find us hard to deal with… That, too, is understandable, because there seems to be some confusion as to what a ‘beginner’ is. Some people refer to themselves as such after years of training; others, like me, wish they could be so humble! I certainly wished I had been humbler with my ambitions when the first day of training started – at 5.30 in the morning, with a 10k run. Running has to be the most painful form of exercise for my body’s many injuries, and doing so much of it every day sounded like a grim prospect. I only managed 5k on the first day, after which, out of breath and energy, I slowly walked back to the gym. There Muay Thai training proper started with a session on pads. One of the trainers called me into the ring and told me to ‘shadowbox’. ‘Yes, right,’ I thought, ‘but HOW?’ Recalling what I’d been shown at the two previous training sessions I’d attended, I started staggering across the ring waving my hands – boxing gloves and all – in the air. I imagine it must have been rather a disturbing sight for the eyes, which are used to watching the best of thai boxers. Next, the trainer put the pads on his hands and, throwing his right arm forward yelled ‘Yaaaaaaaap!’ ‘I don’t know what to do!’ I yelled back at him, eliciting but another ‘Yap’ in response. So, swallowing my shyness and confusion, I just punched the pad, and another one was instantly offered up for punching. I hit that, too, pretty pleased with the fact if not the way I was was actually punching something. But then something unexpected happened: the trainer stepped away, bent slightly forward, and, placing the two pads in front of his abdomen, yelled ‘Kick!’ Kick? Right. Umm. What would Chuck Norris do: (http://www.youtube.com/watch?v=f67LgpJBPPE )? Well, what I did looked, perhaps, a little different but certainly had similar visual – if not physical – impact on my audience. I was hopelessly bad. I kept on trying however, ever-conscious of how embarrassing it all looked. When I left the ring, it was time to punch and kick the bag for a few rounds. Again, I was, of course, a mess. Luckily, the 1-hour training came to an end. A different trainer trainer led a session of conditioning exercises, and a foreign Muay Thai student was put in charge of the stretching. I woke up to the clanking of harnesses, and looked at my watch: it was just before 7 am. Reluctantly, I loosened the string around my sleeping bag’s hood, and popped my head out into the icy air of the tent. 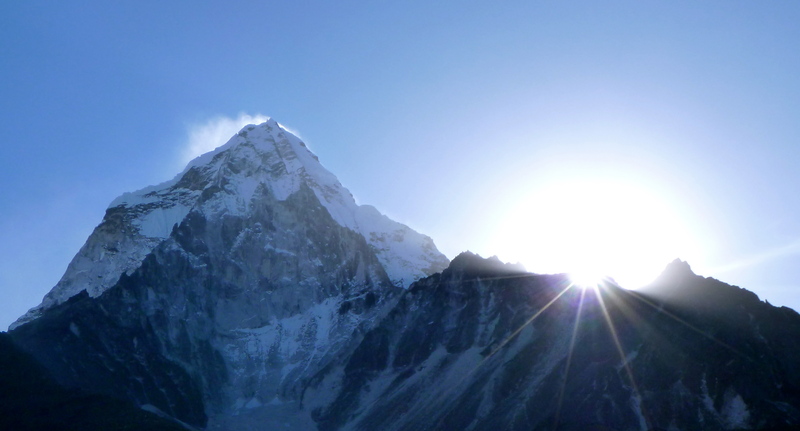 The sun would not reach base camp until after 8 am, and I could not imagine getting out of my sleeping bag and changing in such cold, but I would have to: the three climbing Sherpas were heading up for what I’d told them would be the last attempt to fix rope up to Camp 2 – it was too cold to linger at base camp and wait for the weather window, which might or might not open before we freeze and the morale sinks below sea level. ‘Don’t risk anything,’ I told the boys as they walked away. Tired of that voice in my ear, I made an announcement to the Sherpas before I went to my tent that night. 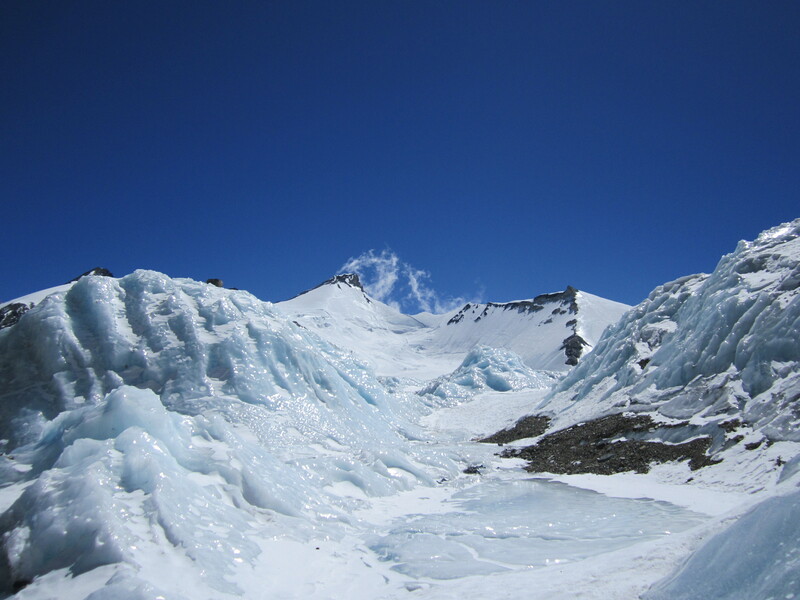 ‘I have an idea,’ I said… I told them they would go home, while I would stop in Pheriche on the way down, wait for the permit to be issued, and then go to climb Cholatse – solo. They laughed my ‘idea’ off at first, but when they realized I meant what I was saying, they began to worry. ‘No, I want to climb alone,’ I insisted. Touched as I was by this display of loyalty, I truly didn’t want any of the Sherpas climbing with me anymore. For them, climbing is a job, for me – a passion; thus, while I can, perhaps, be justified in pushing past my limits, they should not feel compelled to follow where only a madman/woman would go. I didn’t want the responsibility – it weighed too heavily on my shoulders. For once, I wished that it would be just my doubt and I, climbing together as far as we dared. It was not to be, however. When I woke up next morning and prepared to go for a swim in Pumori Lake, one of the Sherpas was assigned to follow me and make sure I was ok. The swim was cold and invigorating, and gave me the strength to stay calm and collected when the expedition team left base camp next morning. On descent, I was again accompanied by one of the Sherpas, who would look concerned every time I would stop to look at a possible route of ascent on the fascinating Cholatse. ‘What do you think?’ I asked him about a line I painted on the mountain. ‘Looks fine. But you can’t do it alone.’ Down in Pheriche, where we stopped for the night, the wind was wild, ceaselessly throwing sand and dust in one’s face. It was still early in the day when we arrived, which gave us much time to talk about my newest bad idea – Cholatse solo. The conversation made me realize that there was no way I would be allowed to stay and climb on the mountain unsupported. In the evening the rest of the team arrived with the yaks, carrying expedition gear, and, looking at my team’s tired faces, I said nothing of Cholatse. The sirdar observed me questioningly, ready for almost any craziness to come out of my mouth, but I simply smiled. 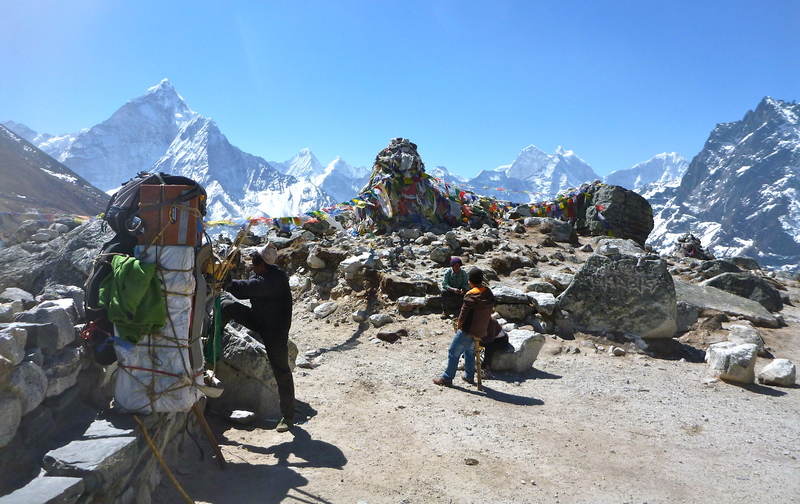 Of course, I would not drag the boys to Cholatse after a failure on Pumori – the whole point of leaving Pumori was to deliver them safely home to their real lives and their families. I told myself before going to sleep that night that that was what I would do: return to Kathmandu with my team, take a rest, and come back – alone – to Cholatse. However, that, too, was not to be.